My first foray into coffee drinking was a Mochaberry from Borders Café when I was in high school. It consisted of a shot of espresso (not expresso, pronunciation is important people, come on! ), chocolate syrup, cream, raspberry syrup and whipped cream. SO yummy! Since then I've had a love/hate relationship with coffee. Depending on the brew it's either watery or a rich mix of flavors, but always bitter. I'm not a fan of hot drinks (yes, you, too, hot cocoa). To make it myself required making a whole pot, which I would never drink in a million years or, ya know, before it turned to sludge in the pot. So, when I saw the Keurig coffee makers, I instantly wanted one! I could make one cup at a time and K-Cups came in so many flavors! Last Christmas, I got one! Being, pregnant at the time, I decided it was not the time to take up coffee drinking, I didn't want to add caffeine. So it was June or July before I bought some coffee and started working out my taste. Coffee (I'm currently drinking VanHoutte Raspeberry Truffle. It smells very berry and chocolate, but pretty much just tastes like coffee. 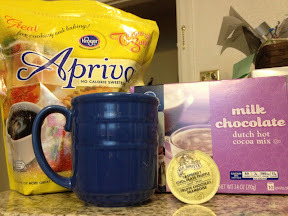 ), sweetener (Splenda for me, but anything sweet) and hot chocolate mix. You read that right! I learned exactly one thing in 2 years working for my former boss, and that was it: an envelope of hot chocolate mix makes coffee AWESOME. Sometimes I add milk or creamer, but it's mostly just to cool my cup. If buy some raspberry syrup and you may never see me again, lol. Go, right now, and break out the hot chocolate mix for your coffee. You can thank me in the comments!